The holy month of Ramadan is not only a great time for fast and feast for those observing the fast but also for us local folk of Mumbai city. Come evening, Muslims breaking their fast and Mumbai’s foodies head to the the South Mumbai locality of Mohammed Ali Road where each night the gullies (by-lanes) off the road erupt into a food frenzy, with a multitude of small stalls jostling for space with the road’s heavy weight regulars. What’s all the fuss about? Well, each evening marks the end of a day of fasting for Muslims; a time to eat delicious food and prepare their bodies and souls for the next day of fasting to come. However, even if you’re not observing Ramadan but just seeking good food, the stalls will welcome you with open arms. 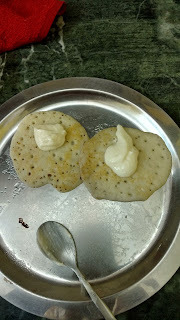 A must try dessert here is the malpua, a pancake-like sweet that is a happy yellow, doused in sugar syrup. Also, bite worthy is the mawa jalebi which is indigently more heavy and sweet than the regular jalebi. Now though I do love an occasional peck from my cousins or uncles I'm not really a fan considering the fact that I'm a nibbler and huge portions of foods in one sitting aint my thang! What I do love though are desserts that are light as air and have a very minuscule amount of sugar added to them. 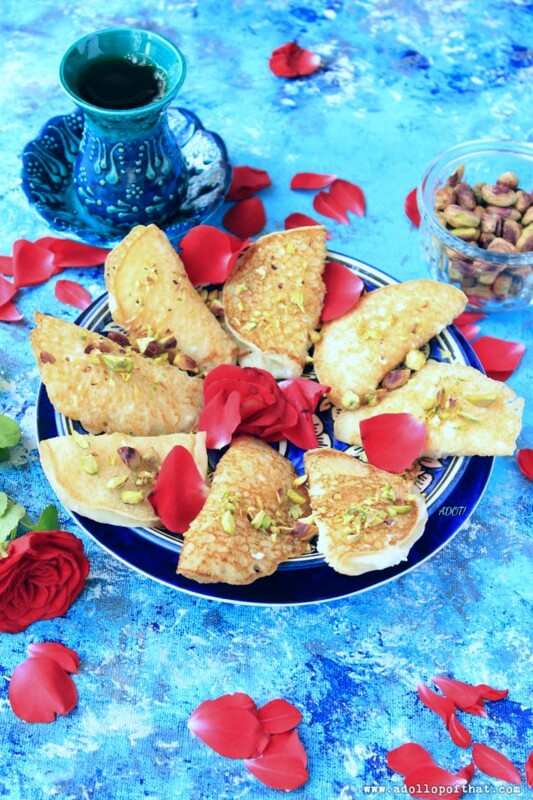 Something about Middle Eastern desserts has always held my fancy, perhaps its the use of rose water and pistachios because it reminds me of my childhood and my grandmother who lovingly sprinkled rose water on my head on any happy occasion. 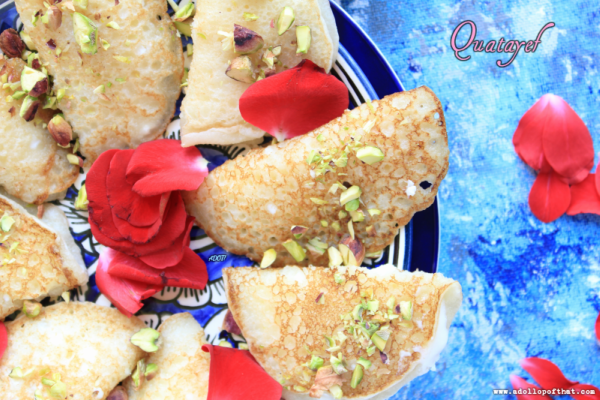 Qatayef or Atayef is an Arab dessert commonly served during the holy month of Ramadan, it is a sort of sweet pancake filled with cream or nuts. 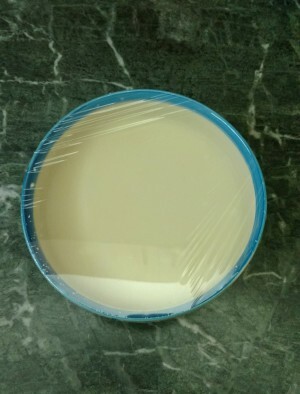 Quatayef is the general name of the dessert as a whole, but more specifically, the batter. 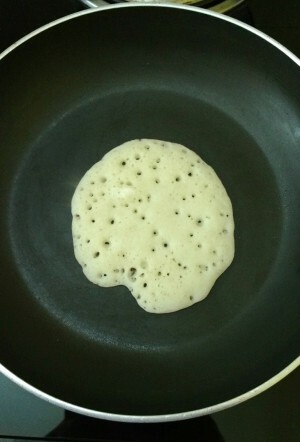 The result of the batter being poured onto a round hot plate appears similar to pancakes, except only one side is cooked, then folded. The pastry is filled with either unsalted cheese or a mixture of any of hazelnuts, walnuts, almonds, pistachios, raisins, powdered sugar, vanilla extract, and cinnamon. It is then deep-fried or, less commonly, baked and served with a hot syrup or sometimes honey. 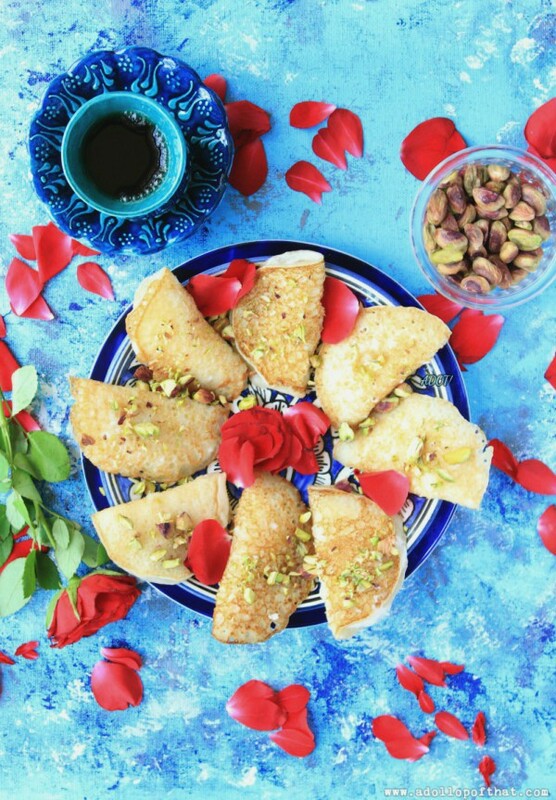 Atayef are usually sold in bakeries in most Arabic countries during the holy month but some people like to prepare them at home as well. 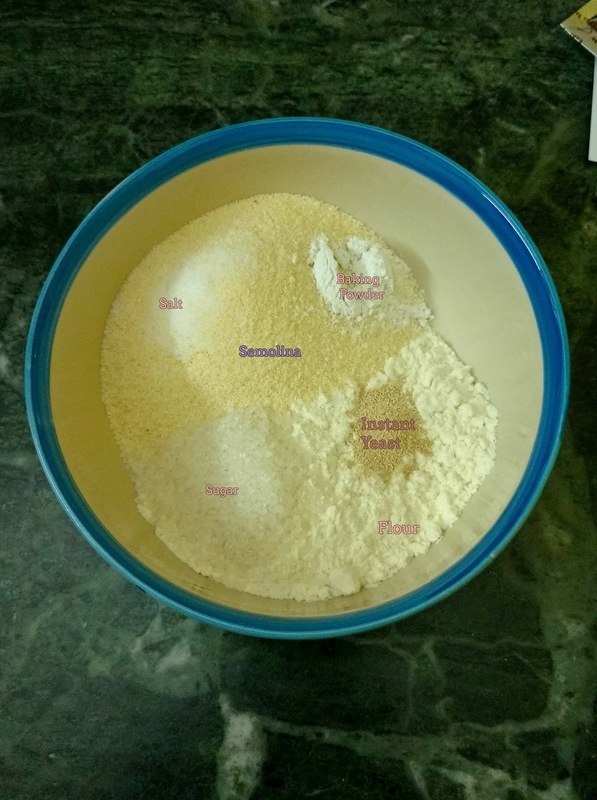 Combining my love for light food and desserts here is a delectable recipe that I urge you to try out, I promise you will love it. In a bowl whisk together the cream cheese, softened butter and sugar till soft peaks form. -In a bowl mix all the dry ingredients. 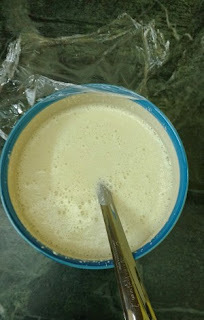 - Gradually add water till you get a smooth, foamy and runny batter. -Cover and allow to stand at room temperature for 45 mins to an hour. -To cook, preheat a heavy non-stick pan, or cast iron skillet on a medium-low heat, have damp kitchen towels ready to stack and cover the atayef as they cook. 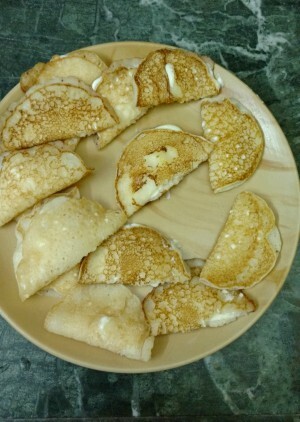 -Pour batter on the center of the pan (to make medium size atayefs measure 3 tablespoons of batter, for small atayef measure 2 tablespoons of batter) . 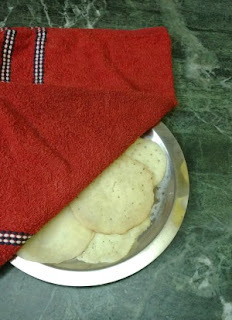 Cook the atayef on one side, one at a time for 25-35 seconds till the top is dry when touched. - Transfer onto a kitchen towel and cover to keep them soft, otherwise they will dry out and it will be difficult to fill them. - Repeat with the remaining batter. - Cool the atayefs for 15 minutes before filling them. - Once cool, put 1 teaspoon of the filling in the middle and fold over the circle to form a crescent shape, pinch from one corner till the next one, until completely sealed. - Cover again and repeat with the rest. 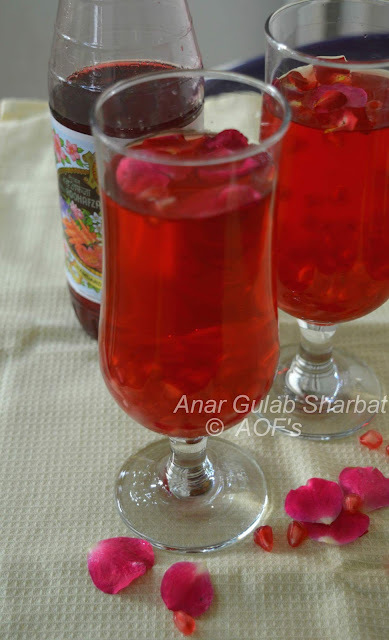 Also do not forget to checkout how to make, refreshing Anar Gulab Sharbat! by Oriya Rasoi!